With less than thirty recipes to go until I finish my taco project, it's getting more and more challenging to think of tacos that aren't too similar to those that I've already made! From the beginning, I've wanted each one to be an original creation - something delicious and a little different, but still a recognizable taco. 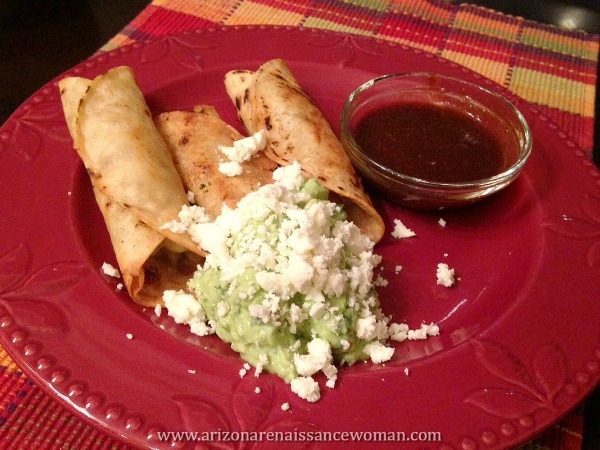 Since Steve and I thoroughly enjoyed my first try at rolled tacos, I thought I'd revisit that process and try some different flavors this time around (of course). I thought of doing potato rolled tacos. But . . . how could I make them interesting? All of a sudden, the answer occurred to me. I've had a spicy, savory, carbolicious pastry wrapped potato creation that's kind of similar to a taco. I love Indian food. I love Mexican food. I love how some of the flavors overlap! Cumin, cilantro, mint, chiles, and tamarind are equally at home in both cuisines. I realized that this would be a perfect opportunity for a fusion taco! The other book that I have to mention as an influence is my favorite Indian cookbook (and probably one of my top five cookbooks of any kind) - 660 Curries! If you love Indian food, I can't recommend this cookbook highly enough! I understand that the Kindle edition is coming out soon. Anyway, check it out! There's one slightly unusual ingredient that you might have trouble finding - the tamarind paste. I've found it at Asian markets before, and I've also ordered it from Amazon. I used a different brand when I made this recipe (because that's what I had on hand), but I've used this brand in the past and I'm sure either would be fine. 2. While the chiles are soaking, start the potato mixture: Place the potatoes into a small saucepan and cover with water. Bring to a boil over medium-high heat. Reduce the heat to low and simmer gently until the potatoes are fork-tender, about 15 minutes. Drain the potatoes and place them in a medium bowl. Add 1/2 tsp. of the salt and coarsely mash with a potato masher. Allow to cool slightly. 3. Once the chiles are done soaking (and while the potatoes are simmering, perhaps), finish the salsa: Remove and reserve the soaking liquid (leave the chiles in the measuring cup. Add the Fresno chiles, onion, garlic, vinegar, sugar, tamarind paste, 1/2 cup of the reserved soaking liquid (save the rest), and the salt. Blend with a hand blender until the salsa is smooth. (Alternately, you can use a regular blender.) Taste and adjust seasonings if desired. Cover and set aside. 4. Cook the vegetables and spices for the potato filling: Heat the canola oil over medium-low heat. Add the cumin seeds and mustard seeds and let them sizzle for about 30 seconds. Add the coriander, turmeric, onion, and another 1/2 tsp. of the salt. Reduce the heat to low and cook, stirring occasionally, until the onions are softened, about 5 or 6 minutes. Add the garlic, ginger, and serrano pepper and cook for an additional minute or so. Add the carrot and continue to cook and stir until it is tender but still al dente. Remove from the heat and allow to cool slightly. 5. While the filling is cooling, make the avocado-yogurt sauce: Combine all of the sauce ingredients in a small bowl and lightly mash together until well-combined. Taste and adjust seasonings. Set aside. Taste and adjust seasonings if desired. Set aside. Fry the tacos, 2 or 3 at a time, for about 3 or 4 minutes on each side or until golden brown all over. Remove from the hot oil with tongs and allow to drain on paper towels. 9. When you are ready to serve the tacos, place three of them on a plate (for each serving). Spoon some of the avocado-yogurt sauce on the side and sprinkle with the crumbled queso fresco to taste. Garnish with the tamarind-chile salsa as desired (or include a small dish of it on the side, for dipping). Enjoy! We loved them! The yogurt and mint gave the guac . . . I mean, avocado sauce an interesting freshness and a definite dairy slant that went well with the Indian flavors. The salsa, while not super hot, was a tasty tangy/sweet/spicy combination that was just different enough to make us sit up and take notice. Now for the bad news: This makes a mess! I had a lot of dirty dishes and pans to deal with. I think that's just the price you pay for rolled tacos. There are also a lot of overlapping steps. I wouldn't say that this is a great recipe for beginners. However, if you're confident in your abilities to juggle several recipe components at one time, you should be fine! There are a couple of things I would do differently next time. First of all, I think my tortillas were a bit on the small side. They were hard to roll up as tightly as I wanted. Last time, I used Trader Joe's brand corn tortillas, which were just a bit larger than the ones I used this time and those worked pretty well. Next time, I'll make a point to use those. If you have an option, I would go for larger and save yourself some frustration. One final topic of conversation: food photography! So . . . I take all these pictures with my phone, OK? This is real life, people. I make these recipes for dinner (most of the time), snap a few photos before the food gets cold, and then we eat! No joke! Ha ha. I've been learning that this is probably not the best way to get awesome pictures of my tacos. We have a rather nice camera sitting around that I have not bothered to learn how to use. I'm going to try. Better pictures will be coming soon. I hope. :) Stay tuned! Feel free to comment on this recipe! Did you try them? What did you think? Is this weird or you also think that Mexican and Indian cuisines meet in the middle in a ton of ways?